Here are some examples of how your donations are helping shelters and rescue groups, in the organizations’ own words. Our shelter won $1,000 for most votes in Wyoming during recent Shelter Challenge on Animal Rescue Site. The money was designated for some outdoor dog run covers that were needed to keep active and/or climbing dogs from going over the top and getting lost. 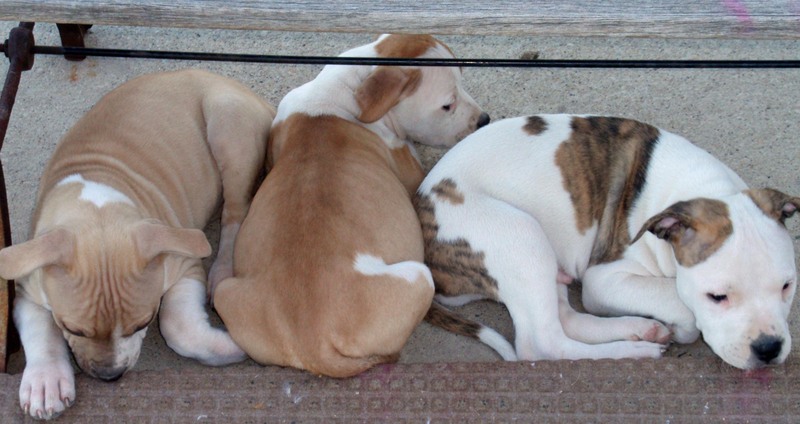 The kennel tops cost approximately $2,400, and the results of the contest inspired a member to host a spring yard sale, the proceeds from which successfully ‘covered’ the rest of the cost of this necessary purchase. The contest encouraged people who followed our Facebook page to share our mission with their friends in an upbeat and inspiring way, and kept people checking our site for updates, where they also could find our featured pets and other activities that were being posted. Winning the grant showed our members that we have power even though we are from an extremely rural area, and that their efforts can pay off to provide for the safety of the animals at the shelter. Because the money was dedicated to a necessary shelter facility improvement, it would be hard to cite a number. Topper is a beautiful blue cattle dog, not large at all, but agile enough to scale the kennel wire fence. He was named, in fact, for his amazing ability to go over the top, and though he enjoyed getting out for a run of the neighborhood, his caretakers preferred that he stay safe until his new home was found. He was walked separately on a leash until the kennel covers arrived, but then he could play with his dog friends again. Now he’s “at large” on a wide-open Wyoming ranch, with a cattleman who says the blue dog stays happily at his side. We refreshed our supply of dog leashes which are used by our volunteers to provide several walks each day for the dogs in our adoption area. We also were able to buy some new collapsible wire cages that we use to loan out for use in foster homes and at offsite adoption events. For cats we were able to buy new brushes, feeding bowls and scratch pads. 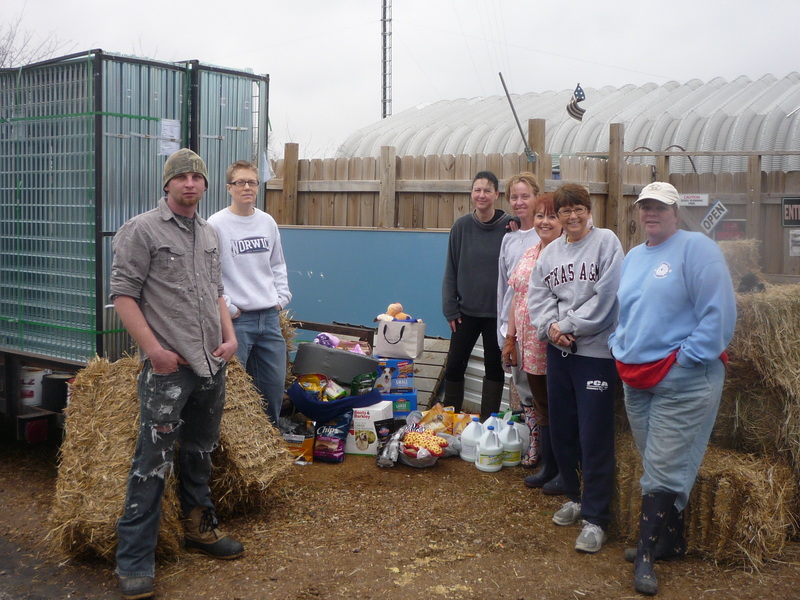 This grant enabled us to improve the general quality of care we can provide for the animals under our responsibility. The leashes are necessary for our volunteers to provide the five or six walks each dog receives every day. The scratch pads and brushes keep the cats entertained and more comfortable and presentable, thus more adoptable. 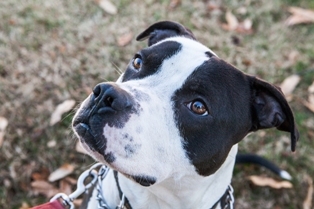 And the specific case described below enabled us to save the life of a heartworm-positive dog. We were able to use the grant to directly or indirectly help all the animals in our adoption area, which averages about 35 dogs and 30 cats at any given time. 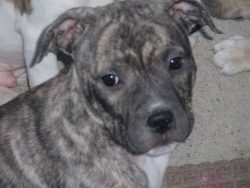 Wilbur is a Staffordshire Terrier mix who was with us for several months. 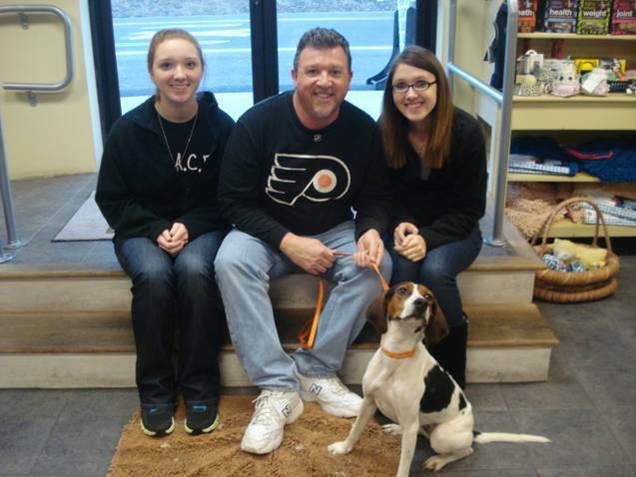 He needed heartworm treatment, which was a deterrent for many potential adopters. When the right person came along, we were able to utilize the Orvis grant money to pay for his medication. A local doggie day care facility agreed to keep him during his recuperation period and several local people donated money to pay the reduced rate at the doggie day care. 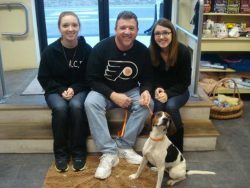 Wilbur spent five weeks recovering, by which time his adopter was ready to take him into his new home. The Orvis grant, in combination with the efforts and money of shelter staff, volunteers, and generous members of the community, enabled Wilbur to end up in a loving home. We purchased much needed replacement fence panels and the volunteers took down the old fence and put up the new fence. It made our dogs safer and made the shelter look great. The new fence panels made it easier for the volunteers to move from yard to yard. 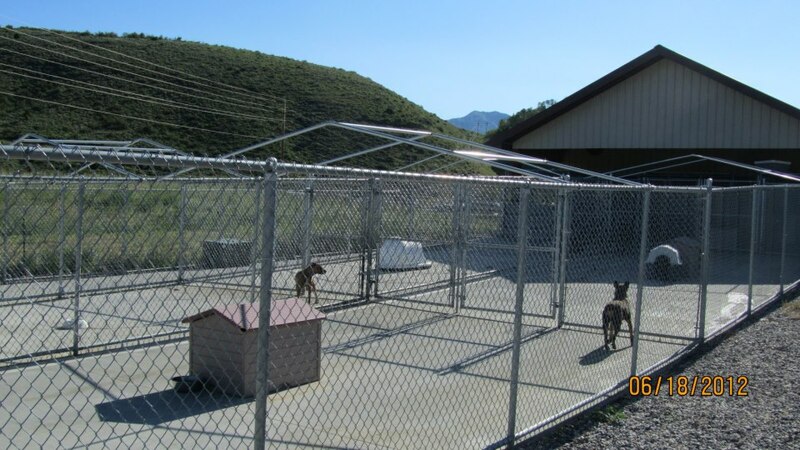 It made our dogs safer and made the shelter look great. The new fence panels made it easier for the volunteers to move from yard to yard. The smaller dogs were able to escape into other yards where they could have been hurt by bigger dogs. The new fence secured the play yards and made it safer for the dogs that were in the yards playing. The new fence made moving from yard to yard much easier for the volunteers, so they could interact easier with all the dogs. Since kitten season is in full bloom, the generous Comfort Zone $1,000 grant was used to purchase special Science Diet (not donated or discounted on the Shelter Program) dry and canned kitten food and bottle baby formula. As Maryland’s largest companion animal shelter and its largest open admission shelter, on any given day BARCS house 110 dogs, 110 cats and has a staggering 700 or more cats, kittens and dogs in foster care! Though BARCS is part of the Science Diet Shelter Program, there is no discount or donation on specialty foods that we use to feed all of the kittens able to eat solid food. 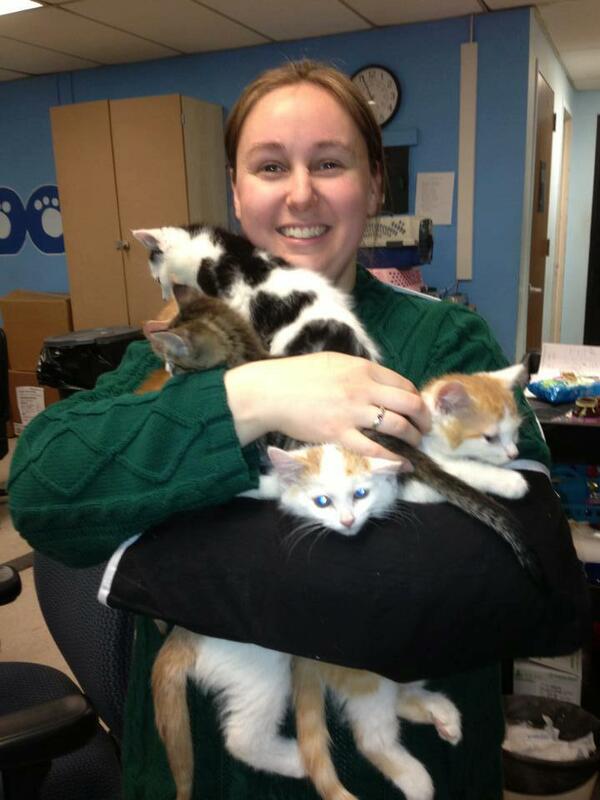 Additionally, our fosters provide everything for our animals in their care, except for medical treatment. Since we get hundreds of kittens every month, many of our fosters cannot afford to keep up with the cost of feeding. This generous grant not only fed the kittens housed at the shelter, but also was provided to financially at-risk fosters so they can continue to feed their kittens until they can all be adopted. 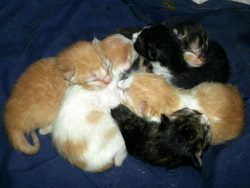 The Pringles kittens (Pringles 1 through 5) were dumped at BARCS and found hiding under our events shed. We were able to trap them all, and the trapper ended up fostering all five of them. She found homes for three of them and kept two for herself! Inky, Stinky, Winky, Pinky, Blinky and Dinky were brought in by a good Samaritan who found them under her porch, but no mom in sight. We found a foster to bottle feed all of them as they were kept together. Now that they are older than seen in the photo, they all have been adopted into loving families from several different adoption events. Blinky is the most photogenic of the litter and a young family that has a little daughter and son adopted Blinky as their first family pet! This funding was used to cover the vaccination costs for 100 of our rescued dogs from January through April 2013. 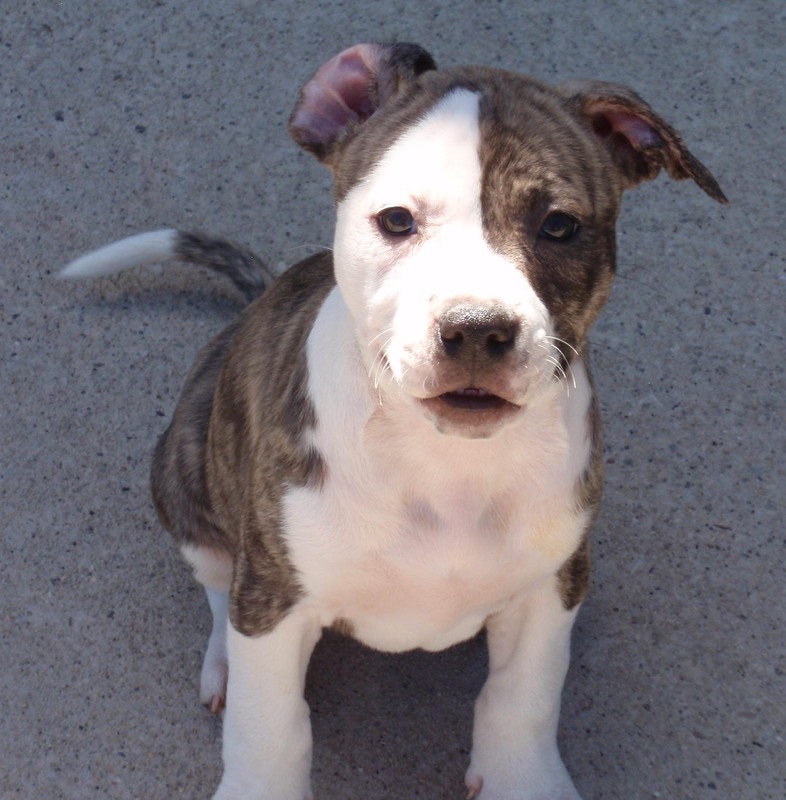 This grant helped us continue to rescue animals from euthanasia lists throughout Utah. The grant covered vaccinations for 100 of dogs, helping to fully prepare them for adoption into our community. UAAC rescued a very pregnant female Pit Bull from an abusive situation. 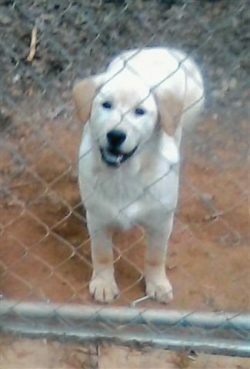 Our ability to take on a pregnant animal, rehabilitate her, and find homes for her puppies is greatly impacted by the funding we received from Petfinder. This female and her pups, when they come of age, will be vaccinated, spayed/neutered and micro-chipped before being adopted. 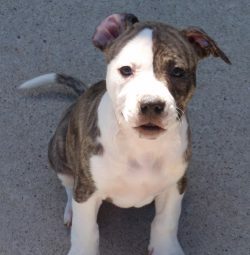 Petfinder’s grant insures our ability to vaccinate these and about 100 other dogs before they enter into the community. Money received from winning the state level shelter challenge was used to pay down our medical bills. Our mission is to rescue animals that are in neglectful and/or abusive situations. Rehabilitating these animals requires providing the minimal care that the majority of these animals have not received. These animals often have not received the vaccinations that would keep them safe from disease, medicine to prevent parasites and of course the most important of all, spaying/neutering that would help reduce the amount of unwanted animals. This is the minimal care provided. Many of our animals require much more in the way of medical care because of the ill treatment they have received. The money received helped us to pay down our medical bills so that we could continue to provide this necessary care to the animals in our rescue. This grant helped many of our animals because by paying down our medical bills it helped us maintain a good working relationship with the animal hospital we work with. It is essential that we have access to medical care and getting to far in debt would stress this working relationship. During a recent rescue mission we noticed a home with four filthy but very beautiful puppies enclosed in a small cage. We discovered that these 5-month-old puppies had spent their entire life in that cage with minimal care because they had been an unwanted litter. Taking on 4 animals who had received no medical care and would require major socialization would have been beyond our means if we had not received the grant. Knowing that Petfinder Foundation was supporting our efforts allowed us to take those babies into rescue. They have all received their shots, been wormed, and will be neutered. Providing just the essential care for these little ones consumed most of the grant we won but so worth it to see them in loving foster homes instead of a filthy pen! We were unable to get the owner to surrender the Mom but we were able to convince them to have her neutered so this would not happen again.Thank you! To help train our dogs to make them more adoptable. I believe there is great net worth in this program, but it is hard to keep volunteers motivated to do it on a regular basis. Our greatest change in behavior was seen in Odell, a young sweet beagle-hound mix who had never been worked with at all. 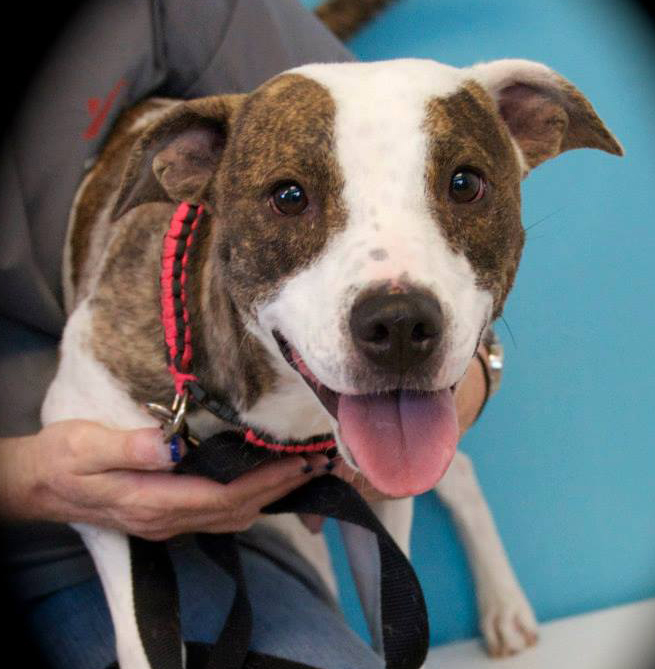 Thanks to the TTA program, she became a model to others, both dogs and humans, and is now happily in a home! The Shelter Challenge grant funds are not segregated from other unrestricted income. Instead, they are used primarily to support purchase of medical supplies and veterinary services for cats in shelter, foster, and outreach care. We received two Challenge grants in 2012. Financially, the $2,000 in grants went into our unrestricted funds. 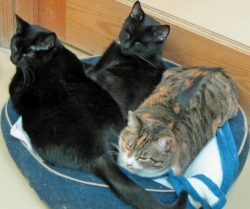 As we are an all-volunteer organizations, the grants enabled us to afford $2,000 more in cat care, such as food, veterinary care, and medical supplies than we otherwise could have provided.Organizationally, the Challenge grants assist Feline Rescue to build action and participation among all our volunteers and supporters. We use social media as well as e-newsletters, our web site, and the low-tech walls at our shelter to encourage voting and participation. Finally, because of the regular quarterly challenges, we’ve built greater visibility and awareness of Feline Rescue within Minnesota’s animal welfare community. Princess Leah and Concho are sisters who have always stuck together. For years, a group of cats lived outside at an armament proving grounds. 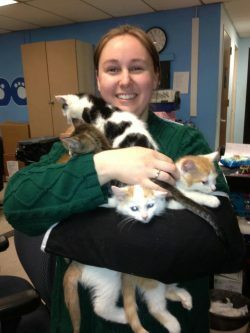 A caring employee contacted Feline Rescue to help get the cats spayed and neutered to break the cycle of homeless cats. Remarkably, the cats were all friendly. So volunteers were able to help not only get them all spayed and neutered but also to get them all out of harm’s way and into loving homes. 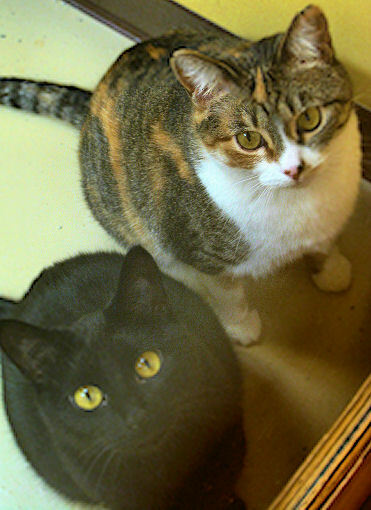 Sisters Princess Leah and Concho were the very last cats to come in from the cold. When they first came to Feline Rescue’s shelter, they would shrink together whenever people approached. But they were curious. Princess Leah and Concho began to come out of their shell – a big cardboard box. They live – and still do – in Feline Rescue’s Flexi Suite, a smaller room that houses cats preferring quiet and not too many noisy neighbors. 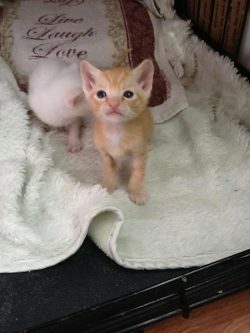 One day, someone dumped Jelly Bean, along with several other young cats, outside Feline Rescue’s door. He had a serious eye infection that cost him his sight. 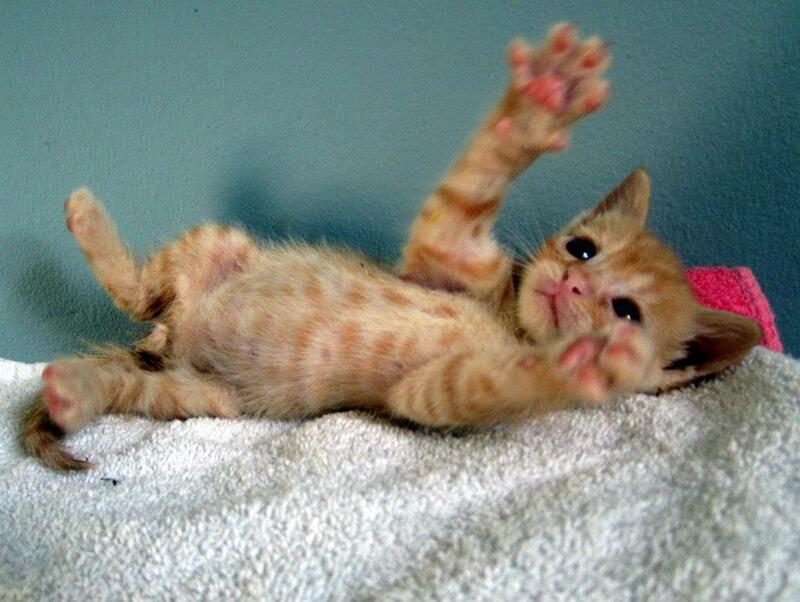 As a no-kill rescue program, Feline Rescue had just created a Medical Miracle Fund, specifically to assure healthy life for ill and injured cats. Jelly Bean had surgery and treatment with a veterinary ophthalmologist. He now awaits his “forever people” at the adoption center. But he’s not waiting alone! Jelly Bean soon found yet another Miracle: Princess Leah and Concho. These two sisters, once timid, quickly surrounded Jelly with love and protection. They guide him when he needs a guide. He, in turn, washes their heads with affection. We were able to order medications through MWI Vet Supply to replace a portion of what was lost. We were also able to alter 27 dogs and 10 cats to send to local rescue groups and to send on a transport offered by LASPCA. This allowed us to free cages for incoming animals and send adoptable animals out of our shelter alive at a time when we were at capacity with animals coming in daily. Recovery lasted several months so it wasn’t until the beginning of 2013 that we were able to start playing catch up and use the funds that were awarded to us. We purchased Nobivac Canine vaccines, for Parvo/Distemper prevention, antibiotics to treat infections from wounds or URI, pain medication for animals recovering from spay/neuter as well as those injured, tapeworm tablets to treat tapeworm in canine and feline, lyme sulfur dip to treat skin infections/ringworm, and syringes to administer the vaccines. We are a small parish shelter that has a limited budget. We were not able to replace lost medications and most of what we had were donated to us by local vets or humane groups because they knew we had a need but not the means to acquire medications. It was upsetting to say the least that we lost supplies necessary to treat animals with minor illnesses and injuries. To be able to treat certain animals gives us the ability to place them for adoption rather than having to euthanize due to a lack of funds. 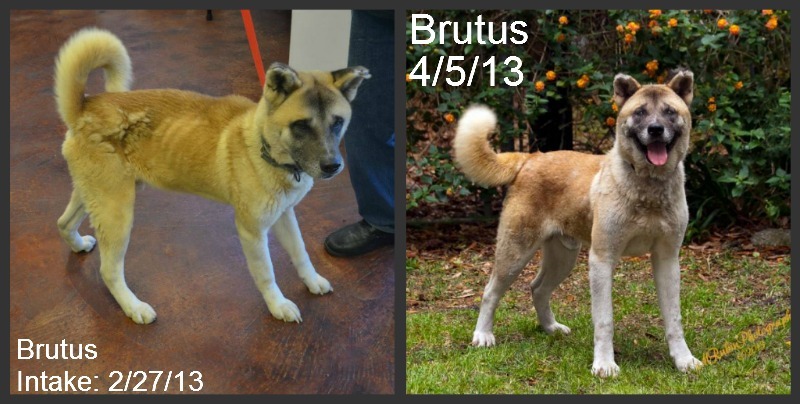 We took in two Akitas from a local backyard breeder. They were both severely underweight and riddled with heart and intestinal worms. 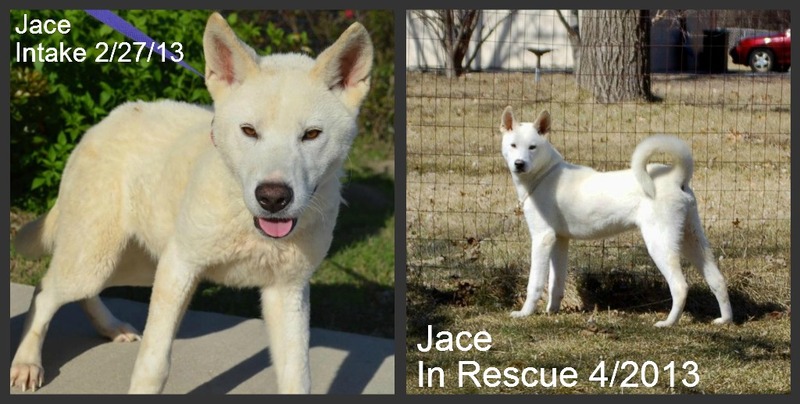 We posted their pictures and sent out emails requesting assistance from anyone with an Akita rescue. 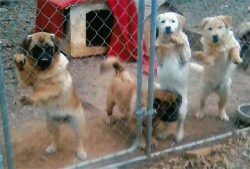 Their story spread far and wide and because we were able to vet the dogs for the two rescue groups they were able to afford the transport and heartworm treatment which allowed them to pull the dogs and get them to safety. The smaller male was 11 months old and weighed only 30lbs. Akitas are normally in the 70-100lb range and sometimes even larger. The are now thriving and waiting for their forever homes.